Sonny and Paul have some things to discuss–and do–in the Days of Our Lives spoilers! 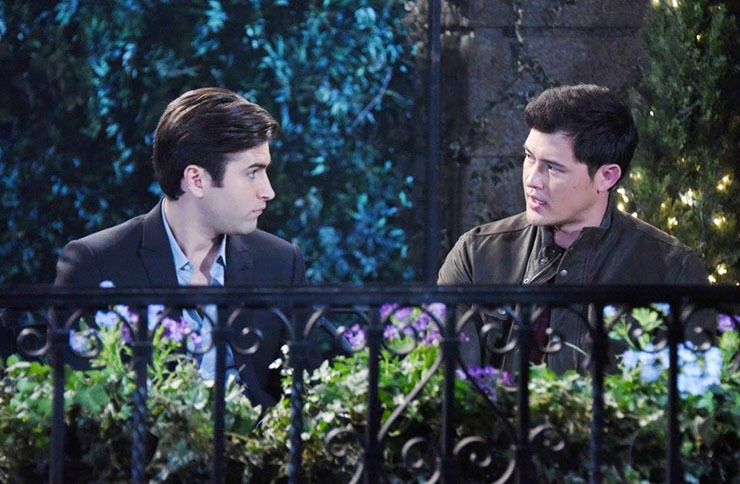 The Days of Our Lives spoilers, for Monday, April 2nd, reveal that Sonny tells Paul something he may not be thrilled about. For a while now, Sonny (Freddie Smith) has planned a coup at Titan, removing Deimos from the seat of power to install himself. It’s all very ancient Greek play, right, Soap Cities readers? Monday he tells Paul (Christopher Sean) that he’s going to be working with the police to achieve this goal. Sonny, because he cares very much for Sonny, may worry about his beau’s safety in all this. Meanwhile, Sonny and Paul take a big step in the relationship department. They make love. It’s been a long time coming for these two, so many fits and starts. But they definitely seem ready to take their relationship to the next level. It’s about time we saw people having FUN on Days too, right, Soap Cities readers? In that vein, Marlena (Deidre Hall) and Kate (Lauren Koslow) have a girls night out. Nothing like a little R&R to put one’s mind in the mode for fantasizing. And that’s just what happens to Marlena! She has a reverie about John (Drake Hogestyn). Gabi (Camila Banus) is still getting over Chad (Billy Flynn), so she’s not thrilled when she hears Chad and Abigail are planning to renew their vows. A renewed commitment means they’re in it for the long haul, devoted to each other and their life together. Gabi probably knew this already, but with a stark reminded like this vow renewal, she can’t even harbor a fantasy in the back of her mind that things could go her way with Chad.